Creates a new renderer with default attributes. Draws the visual representation of a single data item, first pass. Draws the visual representation of a single data item, second pass. Returns a default legend item for the specified series. Returns the paint used to highlight negative differences. Returns 2, the number of passes required by the renderer. Returns the paint used to highlight positive differences. Returns the flag that controls whether or not the x-coordinates (in Java2D space) are rounded to integer values. Returns a flag that controls whether or not shapes are drawn for each data value. Initialises the renderer and returns a state object that should be passed to subsequent calls to the drawItem() method. Sets the paint used to highlight negative differences. Sets the paint used to highlight positive differences and sends a RendererChangeEvent to all registered listeners. Sets the flag that controls whether or not the x-coordinates (in Java2D space) are rounded to integer values, and sends a RendererChangeEvent to all registered listeners. Sets a flag that controls whether or not shapes are drawn for each data value, and sends a RendererChangeEvent to all registered listeners. positivePaint - the highlight color for positive differences (null not permitted). negativePaint - the highlight color for negative differences (null not permitted). round - the new flag value. Initialises the renderer and returns a state object that should be passed to subsequent calls to the drawItem() method. This method will be called before the first item is rendered, giving the renderer an opportunity to initialise any state information it wants to maintain. The renderer can do nothing if it chooses. Returns 2, the number of passes required by the renderer. The XYPlot will run through the dataset this number of times. The number of passes required by the renderer. x_graphics - the graphics device. x_dataArea - the area within which the data is being drawn. x_info - collects information about the drawing. 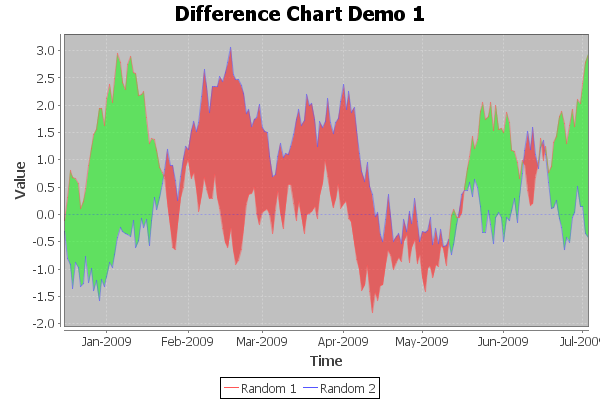 x_plot - the plot (can be used to obtain standard color information etc). x_domainAxis - the domain (horizontal) axis. x_rangeAxis - the range (vertical) axis. x_series - the series index (zero-based). x_item - the item index (zero-based). x_crosshairState - crosshair information for the plot (null permitted). Draws the visual representation of a single data item, second pass. In the second pass, the renderer draws the lines and shapes for the individual points in the two series. Returns a default legend item for the specified series. Subclasses should override this method to generate customised items.